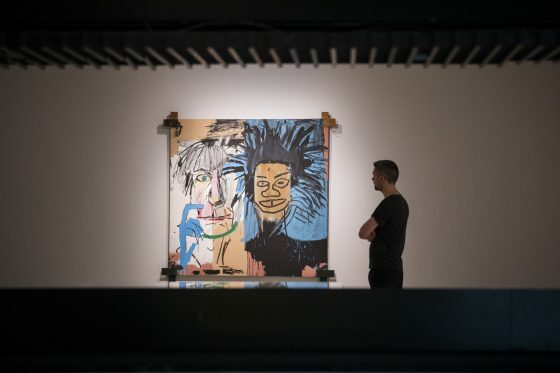 Two members of the curatorial team behind Basquiat: Boom for Real at the Barbican Art Gallery discuss their favourite work in the exhibition and why it’s significant for understanding Basquiat and his career. “One my favourite works in the show is Hollywood Africans (1983), which is on loan from the Whitney Museum in New York. It’s in a section of the show called Beat Bop, which celebrates the record that he produced called Beat Bop in 1983, which features Toxic and Rammellzee. Hollywood Africans celebrates a road trip that he took on the West Coast with Toxic and Rammellzee. The trio mockingly referred to themselves as the “Hollywood Africans” as a kind of in-joke, a comment on the fact that there weren’t any Hollywood Africans in the industry, and that there was this incredible lack of black representation within the entertainment industry. So the painting is really a searing critique on racial politics, but it’s also an amazing celebration of this moment in time with three friends, who frequently collaborated and fed off each others’ practices. It includes a lot of interesting references; for example, there’s a suggestion of a figure that almost looks like an Oscar statue, with the date 1940, referring to the date when the first black actress was given an Oscar – Hattie McDaniel for Gone with the Wind – so there’s an amazing layering of different influences in this painting. It’s also an incredibly vibrant work, with swathes of very vivid yellow paint, but it also tells a very nuanced story. 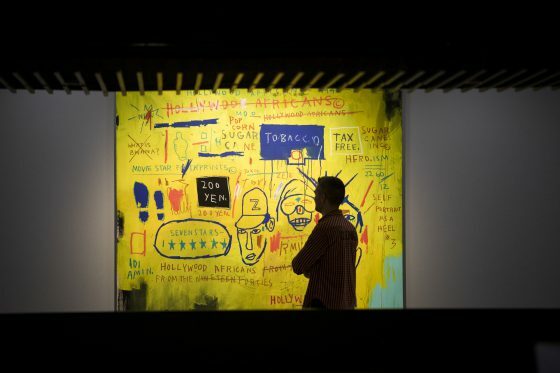 “One of my favourite works is in the section of the show dedicated to Basquiat’s relationship with Andy Warhol. Basquiat and Warhol first met in 1981 when Basquiat went up to a table in a restaurant where Warhol was sitting and sold him a postcard. Dos Cabezas (1982) was made the following year, right after Basquiat first went to Warhol’s studio and they met properly. He went away after their meeting and came back with this double portrait of the two of them still dripping with paint. 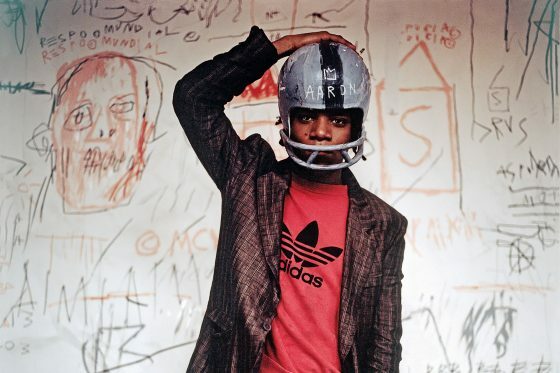 It points to their collaborative efforts and how much Basquiat admired and respected Warhol as an artist. Warhol treasured this painting so much that it went into his own collection. After Basquiat made this painting, he and Warhol made a number of collaborative works, including Arm and Hammer II (1984), which is also on view in the show. We have a lot of works in the exhibition that discuss their friendship and how much they meant to each other, which is something that has often been misconstrued or misrepresented. Basquiat: Boom for Real is on at Barbican Art Gallery until 28 January 2018. Read more and buy tickets here.